1. What we can drink for the next few months: winter champagne punch with rosemary syrup! 2. I’ve decided that we need a day in between December 31 and January 1. You know, like a day to get our act together FOR January 1. Because I want to fully enjoy the end of December, but I want to start fresh on January 1. Like have everything ready to go. Make sense? 3. Speaking of the new year, I saw this amazing idea all over social media to take an intention walk on New Year’s Day. I love the idea, but live in the freezing cold. Does an intention treadmill walk count? 4. Might make a resolution to steer clear of Target for a few weeks. Which should be easy since swimsuits are out. 5. I’m absolutely in LOVE with the healthy glow collective that Monique and Lee have started. It’s so relatable and… REAL. 6. Thoughts on The Affair this past week? I still thought it was so good, but Helen, what the heck! I go back and forth between liking and hating her. This show makes me feel like I’m IN the show! I also watched the Bachelor last night against my better judgement. So many good shows start soon… Nashville! (will it be as good?) Homeland! Billions! Wahoo. 7. On NYE we watched the Shallows and I’ve had shark nightmares ever since. We also took Max to see his first movie last week – we saw Sing and I loved it! Eddie thought it was MEH. Annnd while we’re on the subject of random media, I’m currently reading Lauren Graham’s book. Going to do more book posts this year, I swear. 8. Making 2017 the year of QUALITY. Gosh do I love this so, so much. 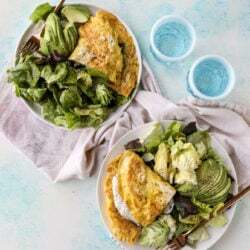 15 Minute Spinach Burrata Omelet with Avocado Salad. Unfrosted brownies for the win. Homeland already started! Sort of! They randomly released the first episode of Season 6 over two weeks early. I think the rest are coming out on schedule though. So naturally I spent the whole weekend bingeing on Season 5 so I could watch the first ep last night! ughhh i know but i’m such a crazy person and will be sad if i watch it early and then can’t watch the other episodes… so i’m holding back. HAH! I second the day between New Year’s Eve and January 1! How is anyone supposed to start the year right when you’re crawling to bed at 3 am?? Amen to trying to stay out of target. YES to needing a day between New Year’s Eve and New Year’s Day! I’m SO with you on that one! Also, yes to unfrosted brownies! Why do people feel the need to frost brownies?? Just no. Yes, to the day b/w December 31st and January 1st. You need the time to regroup and start fresh. I will take brownies any way and yes prefer without it, but I have actually had frosted ones, the frosting actually complements the brownie and that’s hard to achieve. i forever will wish that day into existence. she really was the worst. LOVED Lauren Graham’s new book! oh yay! i’m about 4 chapters in. Team frosted brownies FOREVER (I still love you). Alway love your lists, Girl! #2 -> right on and I totally agree with you on brownie frosting with the exception for pb and maybe also for extra dark fudge frosting! Happy 2017! Agree with number 2! It took me forever to get off the couch on Sunday. So I actually went to Target tonight and it was practically abandoned. I was so confused and then I spotted the bathing suits. NO THANK YOU! I promptly texted my best friend and warned her too. Who in the heck would want to think about getting in a bathing suit right now?! Only someone who didn’t fully enjoy the holidays and all the great food and memories that it brought is all I can think of. ? I hope you enjoy Lauren Graham’s book! My husband gave it to me for Christmas, along with Eat Like a Gilmore, an unofficial Gilmore Girls cookbook. 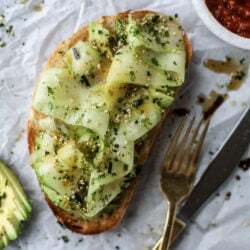 Every recipe is from an episode, totally fun read! Ok, I admit my obsession! On #2 – I so agree! I’m always just useless on January 1st. Although since Jan 2 is a work-free holiday I use that to get back into a normal schedule, when the city is still so quiet. I haven’t watched the last episode of the Affair just yet! Need to before the weekend. :) Helen is kinda annoying this season! Can we talk about those sprinkles? Also, I think it needs to be a national holiday the week after New Years. Because after all of the holiday sparkle, cheer and craziness, I need a week to detox and going back to work one to two days later just isn’t working out! Frosted brownies…while I probably ? wouldn’t turn one down, I’m definitely part of the unfrosted team. December 32nd? Brilliant! Especially when our kids went back to school on Jan 2nd this year. There was no time to prepare! Quality…I’m all over it. Quality and Value. Let less be more. Let less be better. Let what ever we spend our time doing actually be worth our efforts for ourselves and those around us. Love Lauren Graham. I saw her about a month ago at the 92nd Street Y. I had a god awful cold but I refused to miss her. Everyone sitting g bear me probably wanted to kill me since I kept coughing. I really enjoyed her book and the Gilmore Girls reboot. Happy New Year! Are you going to do a resolutions/ goals post this year? Last years was one of my favorites! Finally started watching Billions and it’s so good!! 3 episodes left of the first season. Looking for a good book for the new year…any other favorites?! I am going to check out your recommendation above about Lauren Graham’s book…love her and I miss Parenthood!! i’m the same way on the brownie situation ☝?